See what the press has to say about our projects in America! Hearing the diagnosis that you will be losing your eyesight is something no one wants to hear, but losing your eyesight as an artist and a writer can be catastrophic. Hear from Carolyn as she speaks to KFDX News about her journey with macular degeneration and how it hasn’t stopped her from living life to the fullest. 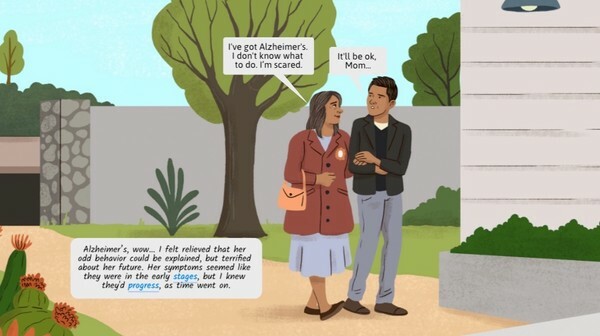 Alzheimer's Xplained uses colorful illustrations and simple, conversational text to help make the disease more understandable to families. Read the story behind the story, as our founder Dr. Kim Chilman-Blair discusses why she started Medicine X and how she hopes sharing Esai Morales and his mother’s story will help other patients and their caregivers. Our very first podcast discussing behind the scenes of Alzherimer’s Xplained with Esai Morales and our founder Dr Kim Chilman-Blair. Hosted by Chris Denson, this humor-filled and touching podcast focuses on the explosion of Medicne X, Kim & Esai’s camaraderie, the big pharma debate, biotech, and the future of storytelling. "Accurate, easy-to-understand, empowering info for those diagnosed with GP? Yes, please!" Read what Crystal Saltrelli of Living with Gastroparesis had to say about our digital story - Diabetic Gastroparesis Xplained. 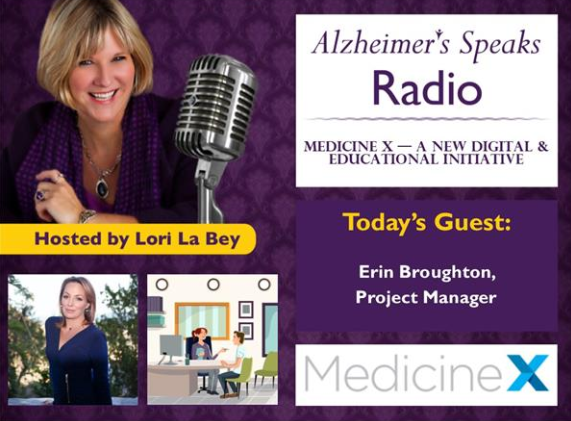 Erin Broughton, Project Manager at Medicine X speaks with Lori La Bey, host of Alzheimer's Speaks Radio about our new digital and educational initiative, Alzheimer's Xplained and how Medicine X are bridging the gap in patient education. The US Pain Foundation is one of our newest partnerships! Together we are aiming to help people better understand and manage their conditions, and realize that they are not alone. Check out what they had to say about us! Want to get in touch with our awesome PR Manager in the USA? Drop her a line directly at madisonlazas@medicinex.com. Press inquiries? Want to know more about Medicine X? Download our media kit below!